The Larson Electronics LM-30-8-5S-4X150RT-LED-EW-SM-RD skid mount electric light plant provides a safe and effective way for operators to quickly deploy 600 watts of intense lighting to elevations up to thirty feet. The four 150 watt LED lamps produce a wide spread of intense white light, allowing this unit to effectively cover large work areas with high quality illumination. The light tower features a rotating boom that allows for 360° of rotation, a removable mast head for storing mounted equipment when not in use, and is mounted to a cube frame with skid pockets and 4-corner pick eyes for easy transportation. When ordering this product, please choose between the following finishes: powder coated or galvanized. The LM-30-8-5S-4X150RT-LED-EW-SM-RD five stage telescoping steel light mast with electric winch from Larson Electronics is designed to quickly and safely deploy 600 watts of intense LED lighting in locations where elevated illumination is needed for maximum area coverage. This light boom can be extended to 30` for maximum area coverage and collapsed to 8.83` for applications where a footprint smaller is required. The tower is constructed of square steel tubing with a base section 5.92` in length and 6" by 6" by 3/16" thick, lower section 6.04` in length and 5" by 5" by 3/16" thick, middle section 6.19` in length and 4" by 4" by 1/8" thick, upper section 6.34` in length and 3" by 3" by 1/8" thick, and a top section 6.5` in length and 2" by 2" by 1/8" thick. Each section has a 1` overlap. The mast is elevated using an included 3,500 lbs. electric winch with 3/16" galvanized braided cable. Included with this light tower are four of our wet area suitable GAU-HB-160LED high output LED fixtures producing a combined total of approximately 50,000 lumens at 600 watts. These lamps have a copper free aluminum alloy body that is powder coated or galvanized for added durability and an attractive aesthetic appearance. Special heat dissipating design in conjunction with LED technology helps this fixture achieve an excellent 50,000 hour rated lifespan with 80% lumen retention. Each floodlight is securely fastened to the light boom and each lamp includes a support bracket to help maintain lamp stability within its housing. The lamps are connected to the power source via a water tight male pin connector that attaches to a receptacle located on the end of the telescoping boom. The tower and assembly comes powder coated or galvanized with a glossy blue finish for corrosion resistances and aesthetics. This mast is bolted onto a 1/8" thick carbon steel plate via six 1/2" anchor bolts. The mast and controls are secured within a cube-style frame constructed of 2" by 2" by 1/8" thick and measuring 48" wide by 48" long by 53" tall. Four 4` slide out outriggers with 1,200 lbs. manual crank leveling jacks allow operators to anchor the unit down, providing stability during deployment. Eight skid pockets allow this unit to be picked up from all four sides, and four-corner pick eyelets allow for stable deployment via crane operation. A 50" wide and 2" by 2" by 1/4" thick mounting plate is attached to the upper section of the mast which provides a strong and stable platform for the four metal halide fixtures. The LM family of telescoping towers feature a proprietary mast guidance system, which provide increased stability during high winds. This light plant system can withstand winds up to 125+ mph when lowered to 8`, and up to 55 mph when fully extended. When elevated to its full upright position, the mast can be rotated a full 360°. By loosening the T-Handle, operators can rotate the mast with ease in either direction. The mast can be positioned in one of four different directions, and locked back in place by re-tightening the T-handle. The mast itself spins freely with ease, and can typically be rotated with a single hand. Mast Controls: The mast is operated via push button controls that are externally mounted on the control box exterior. All controls and electronics are housed within an aluminum NEMA 3R control panel. The lights are banked on two individual circuits, with the left half of the lights on one circuit and the right half on another, allowing operators to power two fixtures at 300 watts or all four fixtures at 600 watts depending on the lighting requirements. Wiring & Cord Cap: This skid mounted LED flood lighting system is equipped with 200 foot of 10/4 chemical and abrasion resistant SOOW cord that is fitted with an industrial grade cord cap for easy connection to local electrical circuits. 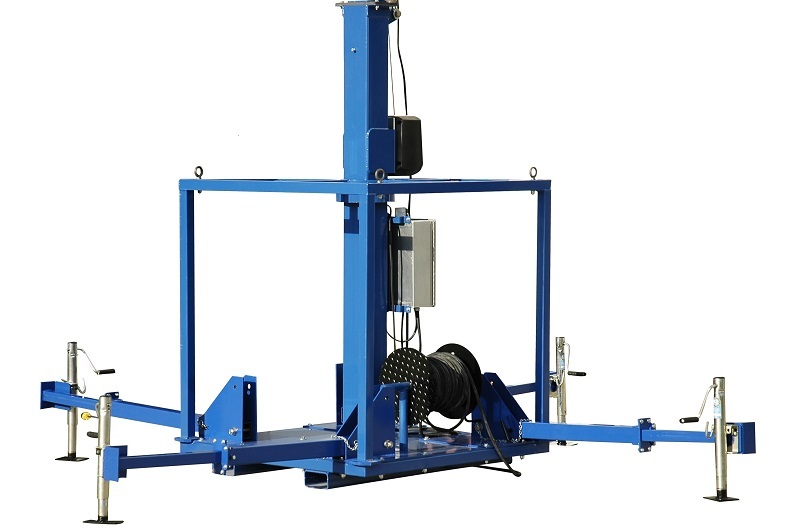 Cable management is provided via a manual roll up drum mounted within the steel cube frame that provides storage for the 200` power cable when not in use or during storage. Each end of this 200` 10/4 SOOW cable is terminated in L14-20 cord caps. Operators can utilize the build in cord reel to extend electrical power connections when in remote locations electrical connections are up to 200` away, or bypass this cord reel and plug directly into the L14-20P cord cap whip from the panel when the light tower is mounted closer to power sources. This light tower operates on 240V AC. The LM-30-8-5S-4X150RT-LED-EW-SM-RD also features weatherproof cord caps on break-aways between the light heads and control box, the electric winch and control box and between the control box and cord reel. Larson Electronics can custom tailor these units to the customer’s requirements with longer sections and larger mounting plates. For example, the LM-25 is another model that reaches to a length of 25 feet, with a 15 foot lower section and a 10 foot upper section and a 4 foot wide upper mounting bracket. 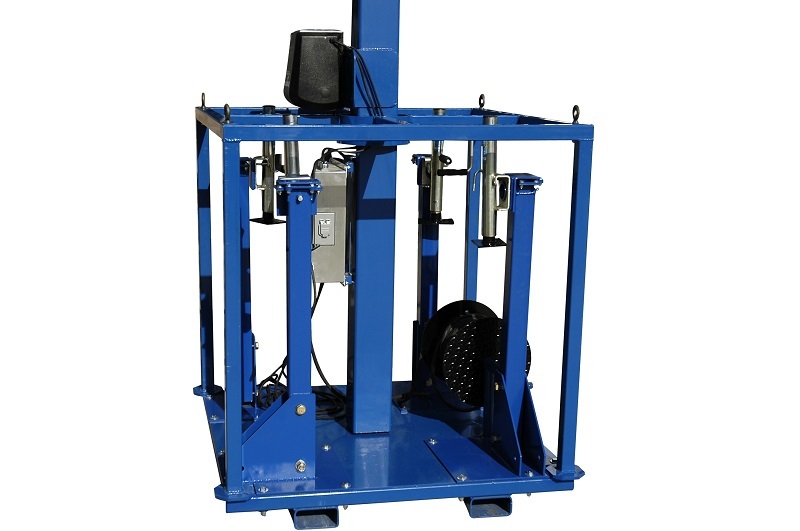 We also offer a choice of either the manual 1,000 lbs. hand winches included standard or optional electric winches.